The Bay Area Brit is a big fan of the Winter Olympics. Not all of it mind you, a lot of it’s pretty dull, and some events shouldn’t be confused with legitimate spectator sports. The U.S. hockey team once again surprised everyone but me. I had no idea that they weren’t the best team, but apparently they weren’t expected to get anywhere near a sniff at a medal. Then there was Shaun White’s aerial “snow-crobatics,” which were totallllly breathtaking, dude. (Rumor has it his body is comprised of 89% THC. That’s why his hair is the same color as the incredibly potent Rye River red bud.) Which BTW if ever there was an endorsement for advocating marijuana legalization he should be the spokesperson. I mean seriously he can do all that when he’s stoned? The women’s figure skating was dramatic too. Ooh, okay, no Brits in the final. So, do I root for the American? Well not if want to back a winner I don’t. Nope, no chance there. She was too…Tonya Hardingesque. What about the darling, teenage South Korean favorite, according to the commentators the nation had already planned the victory parades. Or do I go with my heart and pull for the Canadian. Joanie Rochette, whose mother died suddenly and tragically of a heart attack a few hours before the Canadian was to take the ice for the first time. Yeah, yeah, I know what you’re thinking. Ice skating, really? 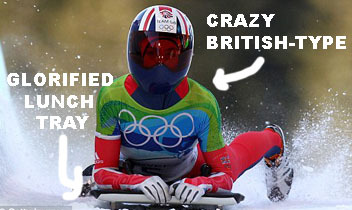 But you have to understand as a Brit, that’s all we’re good at in the Winter Olympics. Come on, you remember don’t you? Torvill and Dean, Robin Cousins, John Curry. These are the names of British celebrities made famous by winning gold medals in Winter Olympics competition. Never heard of them? Well that’s because Americans have a hard time keeping up with their own gold medal winners. But I assure you back home these Olympians were treated like, (well actually better than) royalty. There was one British medal winner this Olympics: Amy Williams. Unlike in America, being British and winning an Olympic medal is sort of like not having to share the prize money with anyone else after you win the lottery. She won in what sport now? Apparently the sport is “Skeleton,” which I assumed you have to be really, really thin to win a gold in. Skeleton, of course is a variation of bobsleigh, except without the comfort and protection of the sled. You’re basically flying down the hill on the base of a sleigh. Stolen cafeteria lunch tray, anyone? Give me a sport that is less dangerous any day: like Curling; the only way you can get hurt in Curling is if you’re busy looking down at the ice frantically shuffling and Shaun White’s snowboard lands on your head after a gnarly jump goes awry. Well that and being blinded by the precocious, colorful plaid pants. Anyway, I’m proud of our Skeleton Queen, Amy Williams. Long may she reign. Providing her lunch tray doesn’t snap in half, perhaps we’ll see her at the next Winter Olympics, which will be held in a place I will learn the location of approximately a week before the opening ceremony in 2014.